Philip Ravita, MA MM has been performing on the East Coast where he is a member of the New York, Washington D. C. and Baltimore Musician's Unions. He is a member of the Baltimore Jazz Alliance Big band, as well as a house band member in Jam sessions in the Washington DC and Baltimore Area. He is also an endorsed Eden Bass Amplifier artist and serves as president of the Maryland Area College Music Association. He is has been principle bass with The Baltimore Philharmonia since 1999 and is chairman of their board of directors. He is Adjunct Faculty, teaching applied lessons on bass, and all string instruments as well as classroom courses at the University of Maryland Eastern Shore. Mr. Ravita also teaches at the Community College of Baltimore County. He has also conducted the University jazz Band while a graduate student/assistant at the University of Maryland College Park. A jazz and classical composer, Mr. Ravita has received awards from Billboard Magazine has received local and national recognition for his compositions. His compositions have received favorable reviews and have been featured in the Baltimore Real Book and on the Jazzscapes I and II published by the Baltimore Jazz Alliance. His jazz group has performed as a part of the Free Fall Baltimore Series. 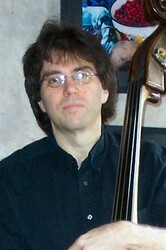 His most recent releases can be viewed on his You Tube channel via his website www.baltimorebass.com.irectors. His most recent releases can be viewed on his You Tube channel via his website www.baltimorebass.com.